In the Purge franchise, America has turned brutally stupid. Once a year, we have a day where "all crime is legal" — which translates into "let's kill poor people." The good news is, where the first Purge was a dull home-invasion flick, the second is a pretty zany action movie, with Frank Grillo as the Punisher. So it's the near future and some right-wingers, the "New Founding Fathers" have gotten rid of the Constitution. America is prosperous and has zero unemployment, because we kill lots of poor people once a year, on the day when "all crime is legal." In Purge 2, instead of watching a dysfunctional family huddle inside their suburban house while evil preppies try to break in on Crimemas, we're smack dab in the middle of the inner city. And our heroes include Grillo's character, who's some kind of cop or soldier (who cares?) who winds up protecting a handful of innocent victims caught in the middle of the annual wilding. This is a major improvement on the dull first movie for a few reasons: first, the violence is way better, because Grillo has Frank Castle's ability to take down a small army of well-armed men with one hand tied behind his back. And instead of just being told that the Purge is about reducing the population of the poor, we see this happening — which makes the political message more concrete and less preachy. And instead of just some random preppy dudes, this movie has villains who are much more evil and formidable. Without giving too much away, their particular brand of evil drives home the notion that All Rich People Are Evil, and the U.S. Government is run by the rich, for the rich. If Noam Chomsky is too subtle and moderate for you, then there's always this movie. But where the first movie was hamstrung by its ambition to be a somewhat serious movie about a family under siege, this film is much more comfortable being over-the-top. Which is good, because with this movie's premise, telling a grounded, "realistic" story was never going to be much of an option. Instead, you've got Grillo, whose character is just a snarky killing machine with a lust for vengeance. And Carmen Ejogo and Zoe Soul as a somewhat relatable mother and daughter who are under Grillo's protection. And then the whiny, bickering middle-class couple (Zach Gilford and Kiele Sanchez) who get stranded in the ghetto, and whom you just want to watch die. Where the first movie put the "gaaaah" in "gonzo," the second almost aspires, at times, to a kind of Death Race 2000 ludicrousness, where killing for sport gives rise to a certain amount of demolition-derby gleefulness and you can watch the inner city get trashed in between bits of ridiculously exaggerated right-wing propaganda. Everyone talks about the Purge with a kind of flag-waving, God-bless-America solemnity that's clearly supposed to be a broad-brush parody of the sort of people who watch Fox News. In this world, not only are all rich people evil, but they dress like James Spader in a 1980s teen comedy*. The rich hunt the poor for sport, while also encouraging the poor to kill each other. And this movie also takes the sledgehammery left-wing commentary to another level, by having a Black Panther-inspired revolutionary named Carmelo Jones (Michael K. Williams) who explains in simple words why legalizing murder is wrong, you guys. 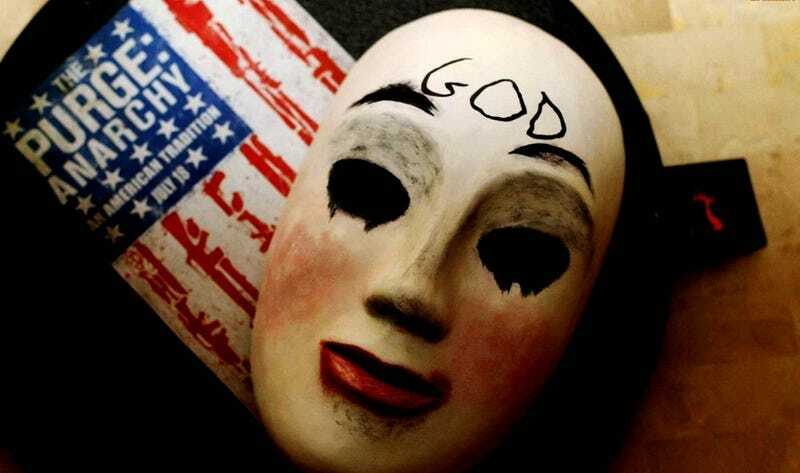 There's something fiendishly meta about making a stupid movie whose premise is that America is stupid — and the runaway success of the first Purge kind of proved its own point. Americans really are dumb enough to support any old crap, as long as there's enough violence and exploitation in the mix. Plus you have to admire the way this movie's marketing parallels the fictional deception behind the Purge — both the movie and the Crimemas holiday it depicts are sold as "all crime is legal, so people can go nuts." And the marketing this time around emphasizes the idea that inner-city gangs will be a major threat this time around — which is the same kind of fear-mongering that you're led to believe sold America on the notion of the Purge in this dystopian future. In both cases, the reality that it's actually a plot by the plutocracy to dispose of the surplus inner-city population is telegraphed heavily, but still not made the central message. Part of why I enjoyed The Purge: Anarchy more than The Purge is that it's more honest, and more untrammeled, with its satire. I actually laughed this time around. And writer/director James DeMonaco has improved somewhat — there are still a lot of tight closeups of people's faces, sometimes uncomfortably close in the same frame, and a lot of wiggly handheld camera work. But he also knows how to sell the atmosphere of urban paranoia and the sense that noplace is safe during Crimemas, with some paranoia-inducing framing of dark streets. The Purge: Anarchy is still not a particularly good movie, but it's a lot more fun than the first one. And it's more of a proper Midnight Movie, in which the people and their world are exaggerated enough to let you laugh at the insanity. If they keep making annual Purge movies, by 2016 or 2017 — when the Purge is actually supposed to start happening — you might actually have a sublime bit of dystopian wackness going here. * Thanks to Esther for this, and for confirming my sense that Frank Grillo is the Punisher in this movie.